This week we have a real treat. This is potato salad molded into a log and spiked with canned corned beef. Because we know how to live over here. This is Potato Salad Roll! Cook potatoes in boiling salted water, drain and cool slightly. Cut into ½ inch cubes. 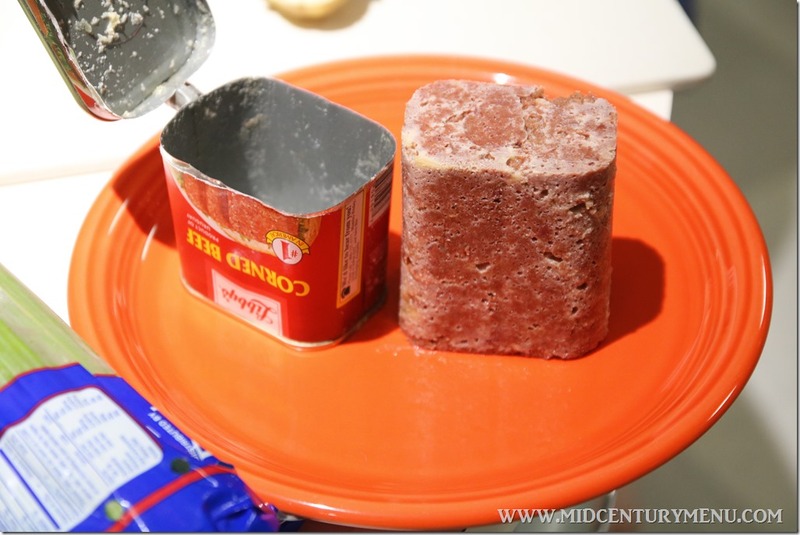 Remove corned beef from can; separate with fork. Combine with potatoes, eggs, celery and onion in large bowl. Reserve. 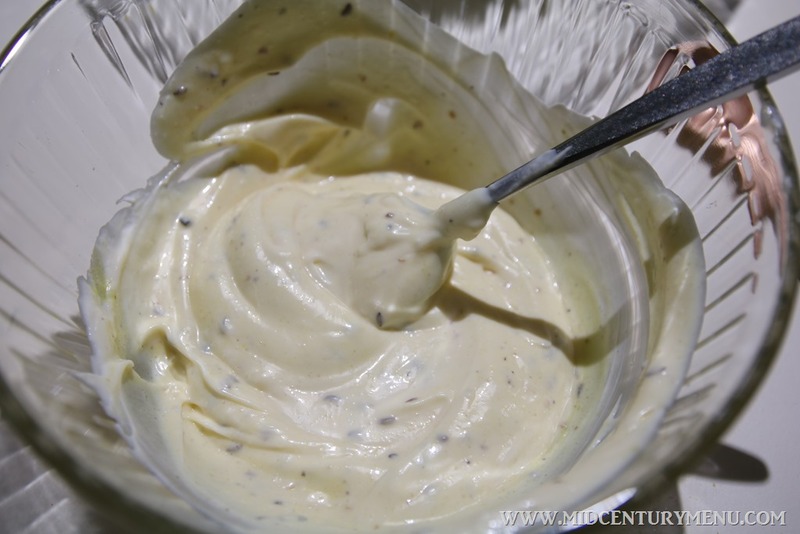 Blend dry mustard with lemon juice in a small bowl until smooth. Stir in sugar, salt, pepper and caraway seeds and add ¾ cup mayo. (I ended up using the full cup, and then using extra for the "frosting") Blend well and gently fold into potato mixture. 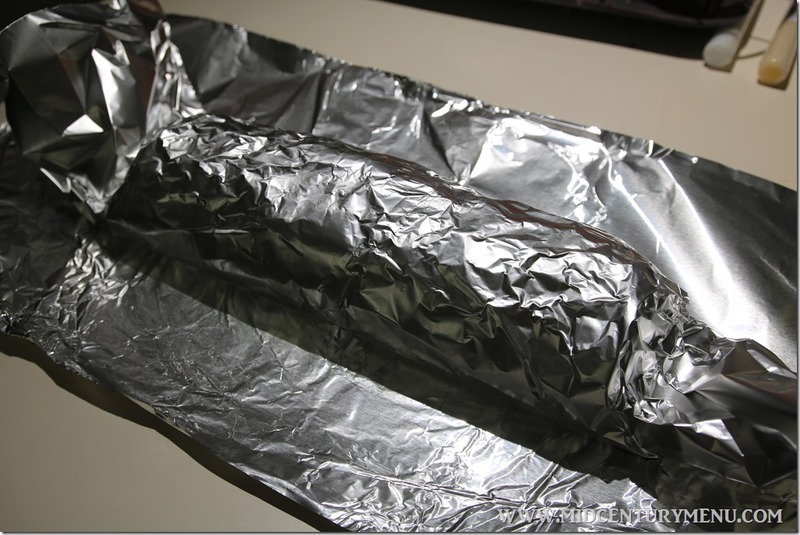 Spoon salad in a long strip on double thickness of foil; roll up, enclosing in foil. Press to form an even cylinder about 10 inches long. Fold in ends of foil to seal. Chill overnight. 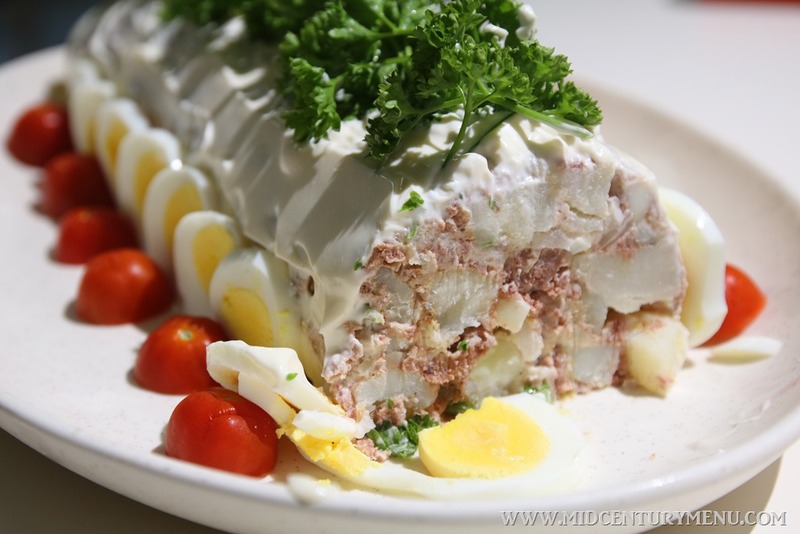 To serve, carefully unroll potato salad onto serving platter (it should be firm enough to hold its shape and slice easily.) 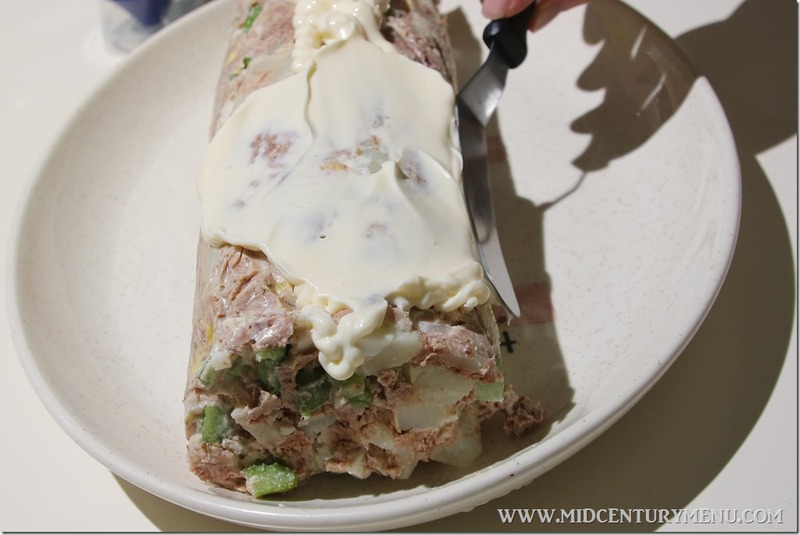 Spread with ½ cup mayonnaise. Garnish with parsley, cherry tomatoes and eggs and cut into even slices to serve. I have to admit, I was especially excited about decorating it. Now, it has come to my attention that not many people cook with canned corn beef anymore. So I thought I would give you guys a glimpse inside the can. Yep, it looks pretty much like cat food. Smells like it, too. And I’m not talking smack about the corned beef, either. I actually like canned corned beef and eat it. I’m just saying that the food I feed my cat looks like this. If you opened a can of corned beef and a cat food and put them on plates side by side, a normal person couldn’t tell the difference. My cat wouldn’t be able to tell the difference. Facts. These are facts. Not opinions. Another fun fact: Crushing caraway seeds is really hard if you don’t have a spice grinder. They are slippery little devils. Another fun fact: Boiling potatoes with the skin on for your potato salad by far and away yields the best tasting potato salad. Peeling them and cutting them up before you boil them leads to mushy potato salad. My maternal grandmother always boiled potatoes in their jackets, and she taught my mom to do it that way and my mother taught me. When I was younger I thought it was ridiculous, but it actually works. 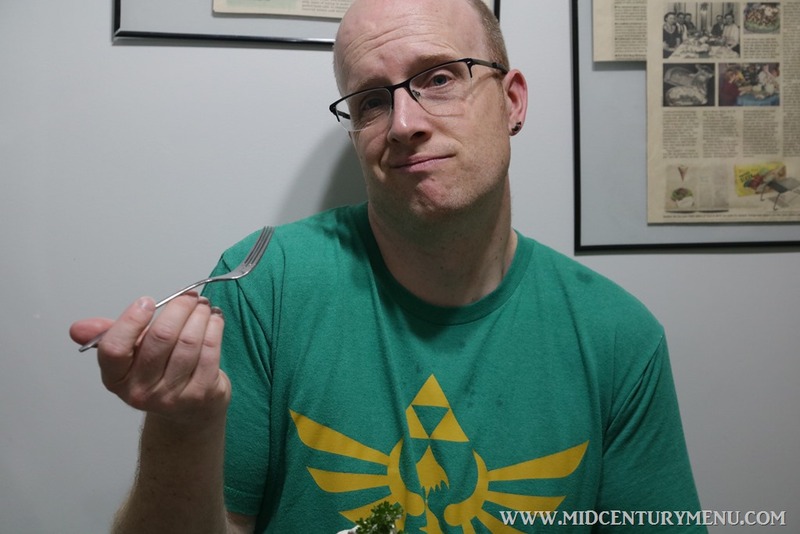 I was very, very happy to see that this potato salad used that prep method. 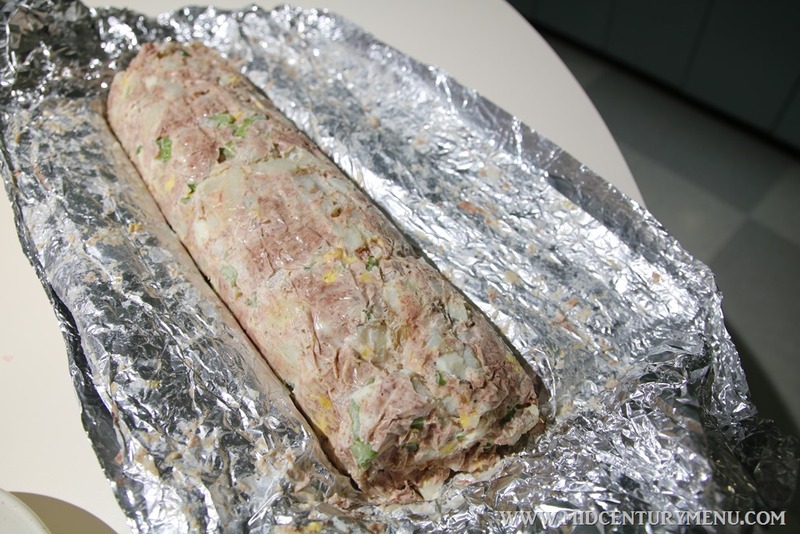 And this is a giant roll of potato salad, after a lot of smushing and some colorful swearing. 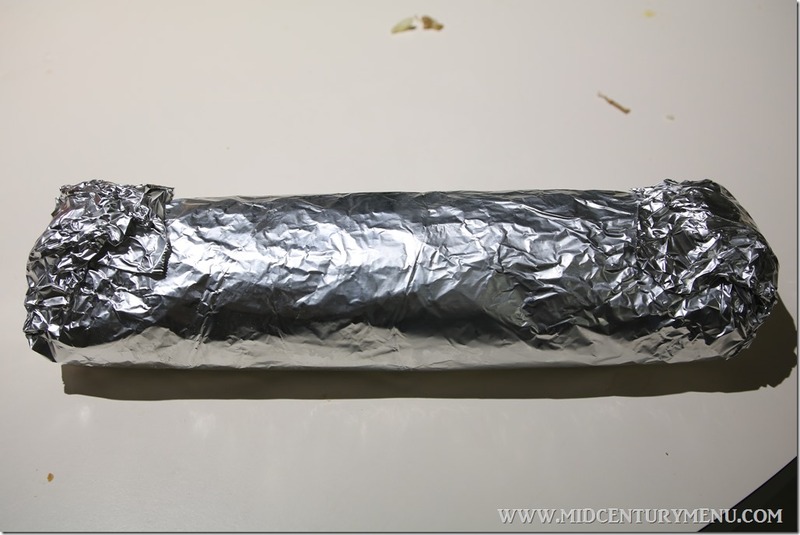 I didn’t end up doubling up the foil, I rolled the salad in a single sheet and then put that sheet on the edge of the second sheet and rolled it up a second time. It seemed to make it much more secure than just rolling in a double thickness of foil. Just for the record, at this point I totally didn’t think this was going to work at all. I didn’t think the roll would be firm enough to frost. So let that be known. But I was wrong. It it did work. Unbelievably, this actually chilled pretty solid, thanks to the fat in the corned beef. It was also very, very heavy. And then I frosted it with mayo. Because that is how it gets done around here! I ended up having to use way more than 1/4 cup of mayo. It was more like 1/2 to 3/4 cup. Fancy decorations, too. In this colorful cross section, you can see the large chunks of corned beef. This actually blew my mind completely. This crazy log of canned meat and potatoes ended up being good. Not just edible, but actually good. I ate my whole piece without once getting grossed out or gagging. Then on another completely separate day, I ate another piece of my own free will and didn’t gag on that one either. Tom also scarfed down his fair share. 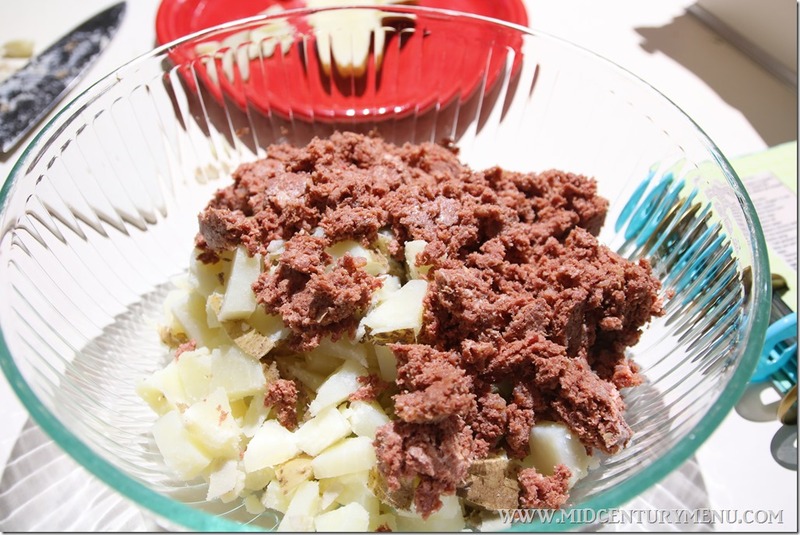 If you are a fan of corned beef hash, then this would be something you would enjoy. 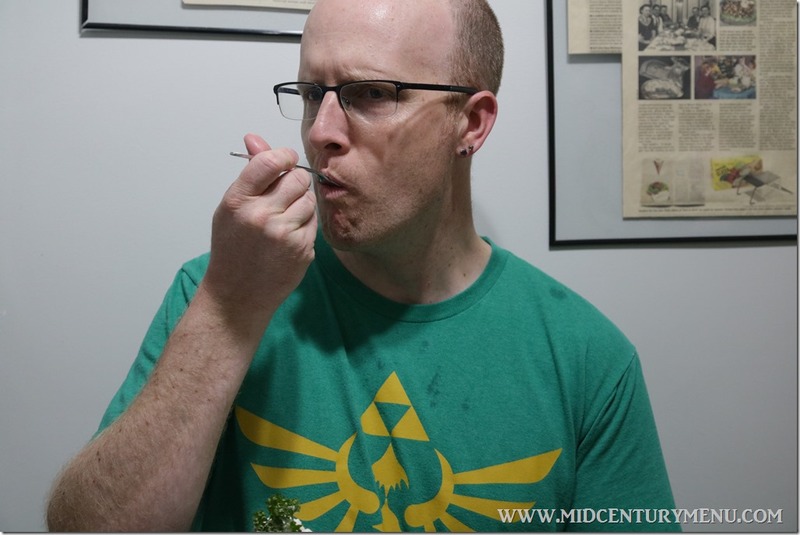 The corned beef adds a good flavor without being overwhelming. 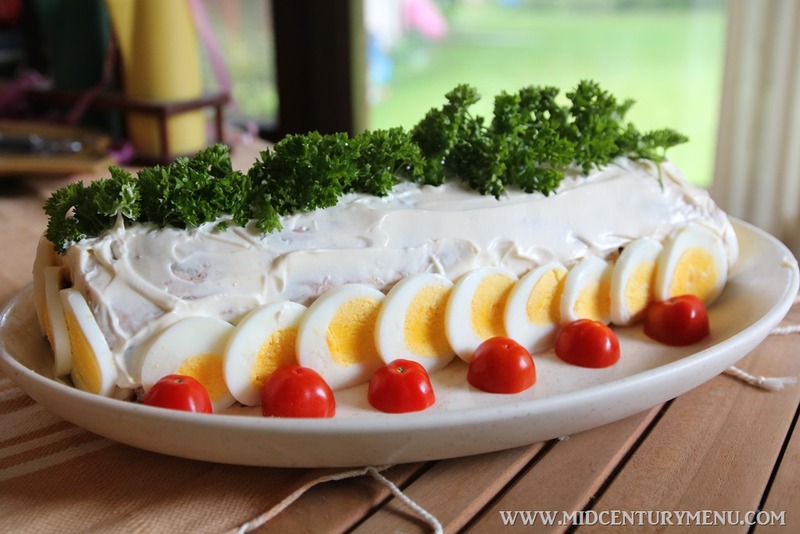 The caraway dressing is probably the best part, that and the egg really pull it together. 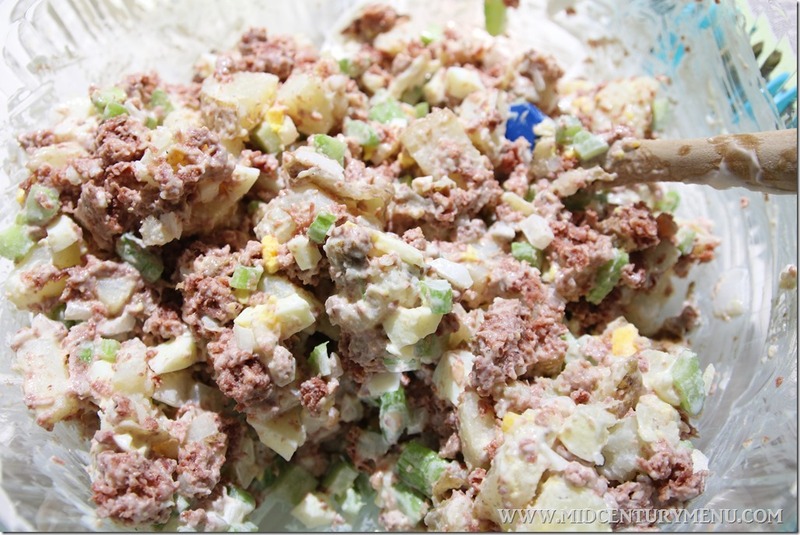 If you aren’t a fan of corned beef, then I would suggest making the potato salad and leaving the corned beef out. You won’t be able to roll it into a “fancy” roll, but you’ll still have a bowl of good potato salad. This is a beautiful presentation! It might be even better if you used higher-quality corned beef from the deli. Honestly, it’s probably the gelatin in the canned version that is what is holding it all together. So it might be tastier but not a log any more. How pretty is that! I’m not a big fan of caraway but it sounds interesting. So pretty, I think I would enjoy eating this! I love this one! It reminds me of those elegant retro recipes my grandmother would make in her brown and orange kitchen. I’d eat the heck outta this. Or put it between two slices of bread. I bet it would be even better if you substituted Spam for the canned corned beef. Just a thought. Your presentation shot is a thing of beauty! I’m glad it also tasted good. 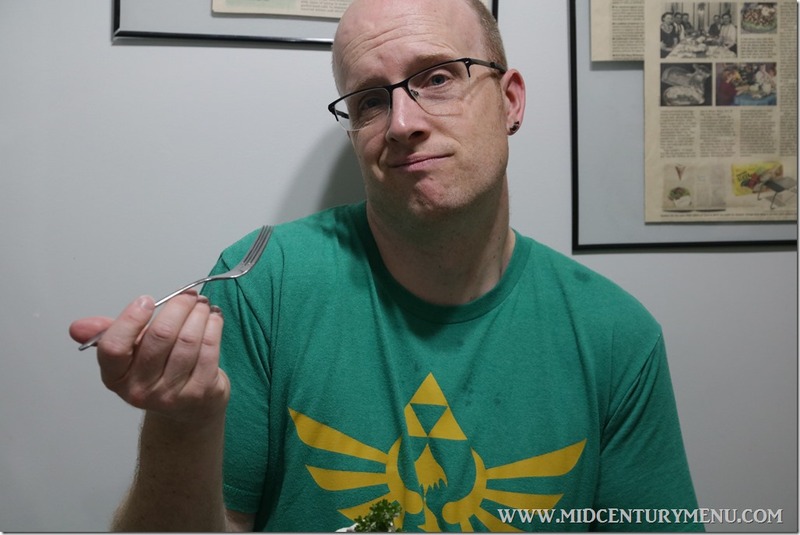 Once I can eat potatoes again, I may try this (I love corned beef hash!). I’m 63 years old, and believe it or not my Mom used to make this. I forgot all about it until you found it. Thanks so much. I will make it as soon as I can, and relive a lovely memory. I do remember it being very good. I tried this recently.Wow, who’d have thought that the love child of corned beef hash and potato salad would be so amazing.